Today's featured wall mural invites you to capture the mysterious beauty of the northern lights as a custom wallpaper installation. The aurora borealis, which is most often viewed around the North pole, has been an inspiration to us. Growing up in Northern Michigan, we were lucky enough to see the northern lights on occasion. Hence, the unearthly glow of the northern lights has long been an inspiration. The custom wall mural we're featuring in the inspiration room features the northern lights in a green hue, offset by the final remains of sunlight disappearing behind mountains in the distance. This gives the mural several strong, independent fields of color. The angle at which the northern lights are presenting gives the wall mural a great sense of motion as well. With custom wallpaper, you can view the northern lights in your home everyday, even if you live nowhere near the North pole. The lights can appear green as in the inspiration room, but they can also shift to blues, reds, and combinations that create heavenly gradients. 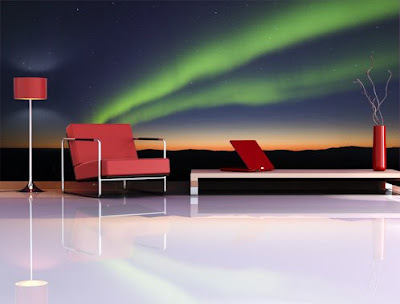 A wall mural featuring the northern lights will inherently have an abstract, artistic feel, perfect for dressing up a room with an original focal point.